The wheels make a difference on any vehicle and is usually one of the easiest (if not always the cheapest) modification to make. Go on any online portal such as eBay, Demon Tweeks, Google, etc, etc to find a whole raft of possible wheels that will fit the stud pattern of the particular car manufacturer you own. 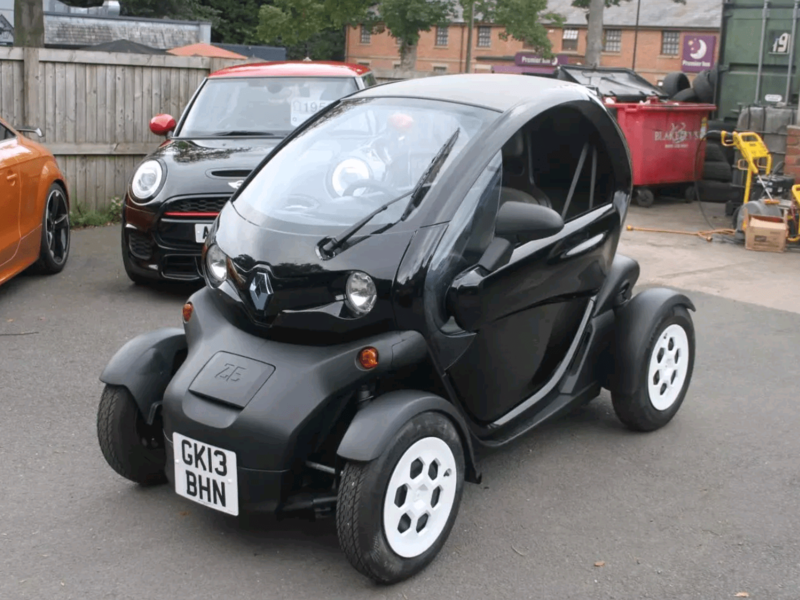 Well you may not be surprised that the Renault Twizy is different. There is quite probably a very good reason for having only 3 studs holding the wheel on, but i can’t really think of one other than it saves the weight of one nut, thus reducing the kinetic energy required for the low powered EV to move and stop along with the cost of one whole stud! Anyways, I totally get the physics of narrower wheels mean less contact thus reducing friction / drag and as a result increase the range the battery can propel the car. However the Twizy wheels are ridiculously narrow, and this I feel is the one reason that it gets a bad perception from people that can’t handle concepts that fall beyond the norm. 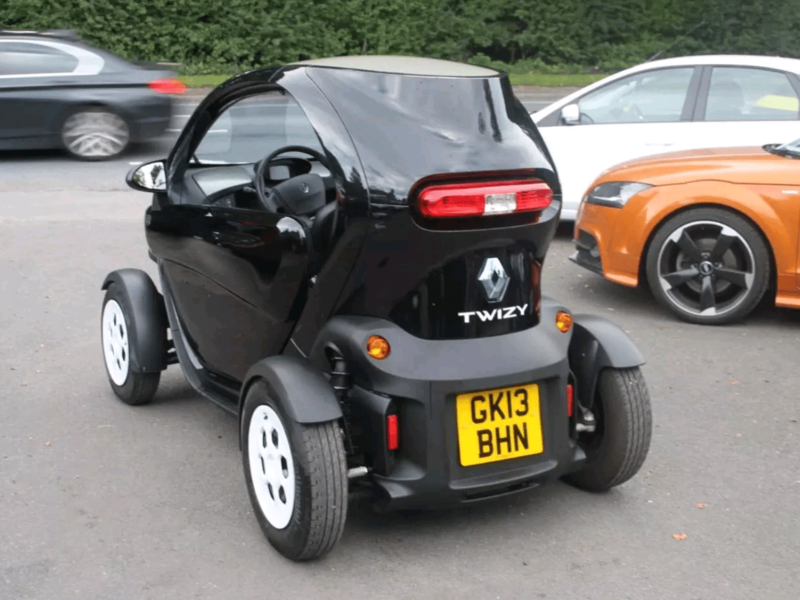 For sure there are people that look, stare and point because they think it looks cool in its standard guise, but for all those that stand on the side of the fence that are not quite sure about the Twizy, the wide wheels will be the deciding factor. So my decision was made that by hook or by crook I was going to put the Burrows touch on the EV. The F1 twizy was inspiration in part, but I had seen other people in the very limited Twizy circle had done some modifications with the wheels. However, the only real route I could go down due to the unique stud pattern was to take the standard steel wheel and have it banded. It’s a process where one side of the rim is cut from the other, they are moved apart the required distance, and a band of metal is welded back in to increase the width. This all sounds very dodgy, but its legal and surprisingly safe. The decision was that the rears were going to be different widths. 8 inches at the rear, and 7 front and I was really happy with them when they were returned from the fabricators. The next stage was to have them powder coated. As can be seen by the photo above, there was plenty of bare metal that would would start to oxidise and rust if it got damp, so I made every effort to keep them in a dry environment until they were painted. I decided on a mid grey for the colour. The reason being I didn’t want silver as it was pretty common, I didn’t want black or the similar anthracite as I felt the wheel rim needed to be a different colour to the tyre to separate them. After a trip to the local tyre garage the rubber was fitted to the rims. I got the impression it was a little more protracted than usual due to the slightly stretched profile of the tyre on the wheel, but the overall package turned out to be really pleasing . I was a little concerned that the rim would protrude the rubber with the width I had chosen, but its not. Which is good as far as dinging the rim. I have seen many VW golfs etc with massively over sized wheels and tyres that are stretch ludicrously. So the next thing was to fit the wheels. I was going to hold off this process due to the fact the mudguards / fenders would need to be removed to accommodate the wheels, which would effectively render the car undrivable during wet weather. However, the temptation got the better of me and I decided to make the change despite this. I’m sure I will regret this in the not too distant future, but at least it will encourage me to get a solution sorted sooner rather than later for a mudguard. Before I fitted the wheels I couldn’t help but spend a little time cleaning up the running gear and brakes. The front calipers were removed and painted. After a good wire brush down I painted them red. I always find that two coats of hammerite is enough to eat into any corrosion and provide lasting protection for every vehicle i have renovated in the past. This would be no different. The same was done for the rear, although i decided against painting the calipers as they were in remarkably good condition. I still greased up the handbrake cable and added a small amount of hammerite silver to any rust visible. As you can see from the image below, its transformed the stature of the vehicle and its stance is much more aggressive. The one thing that lets the Twizy down and turns peoples inquisitivity to err on the side of dislike rather than like, is the puny wheels giving it more of a mobility scooter look than fully fledged road going vehicle. I will say at this point that I am under no illusion that this modification will have a big impact on performance and range. From a performance point of view I have a solution. I will be fitting a device called a PowerBox (More on this in a future post). This will plug into the ODBC port and will override the Renault restrictions in terms of the power output and speed, effectively doubling the performance. There will be a range reduction but that’s something I am going to have to accept. This vehicle for me is for primarily for excitement, as has been all of my previous vehicle. It’s a bit odd, but I hope that this will prove there is a new generation of vehicles that can put a smile on peoples faces, much like the Vespa, Lambretta and bubble cars did all those years ago. Since owning my campervan most of my time and money had been spent renovating that. 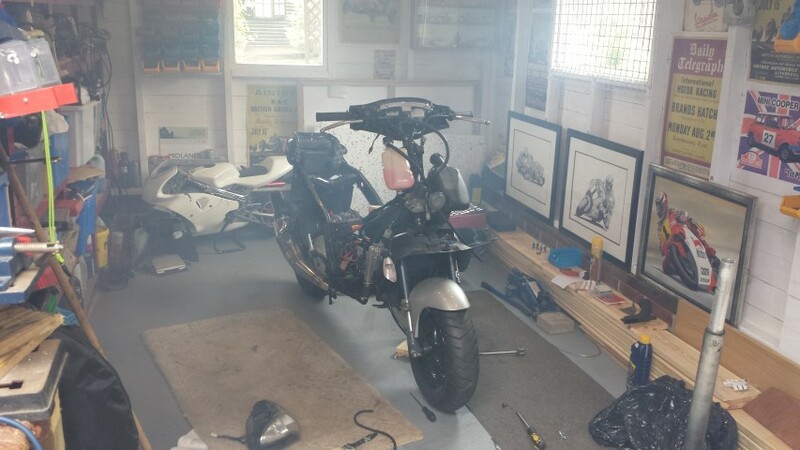 There were a few sacrifices made during that time in the form of the loss of my two scooters to provide extra funding for some of the more major work that needed doing like the engine and gearbox. Although the camper has provided an amazing distraction from these losses, it was only going to be a matter of time before I needed something to fill the impractical vehicle gap. You know, the type that puts a smile on your face. I think the catalyst for my interest for renewable energy has come from the solar installation on my camper. Its proved amazingly effective at giving us free energy for the fridge, lighting, and all of our electronic devices as we live and travel. The only exception has been heating whilst static, which is taken care of by the diesel night heater. This, as you can imagine has allowed us to camp in remote locations without electric hook up, or choose a camping pitch that costs less money due to the fact we don’t need electricity. I think the real buzz factor that goes with having energy for nothing can only really be associated with by like minded people. That said I know this post will not resonate with everybody, but the world of renewable energy will ultimately make everybody’s life a whole lot better once established on mass. If anybody is really interested the best place to delve in is the youtube ‘Fully Charged‘ channel offers a wealth of information about all things green. Highly recommended viewing. 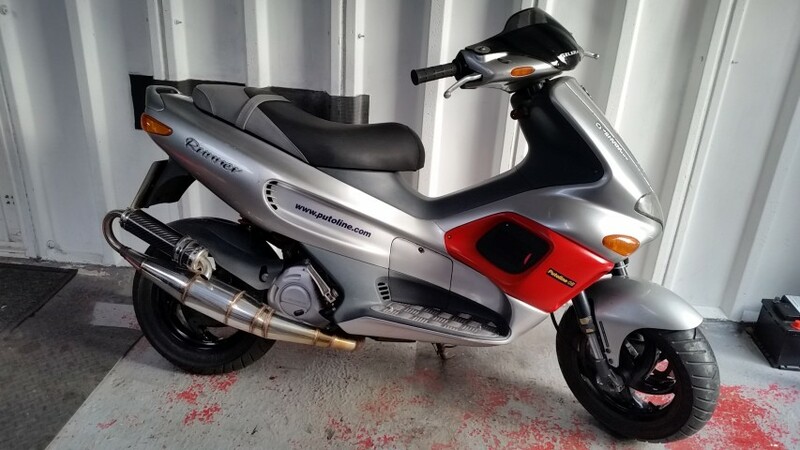 All of that said, it will not be of any great surprise to hear that my most recent purchase scratches the “impractical smile on your face method of transport” along with the “green energy” check box. I first saw the car advertised online during my September campervan holiday. The price was good and I was convinced this Renault Twizy was the one for me! Basically this vehicle ticks all of the boxes and more. Its a blast to drive, gets the heads turning, and costs as little as 60 pence a charge to do 50 miles. It can also be tuned (watch this space) using a PowerBox, and the lack of modifications just make me want to find a way to make this already rare and unique vehicle a little more special. Again…. watch this space. My love of two stroke bikes and scooters started back in the mid 1980s. 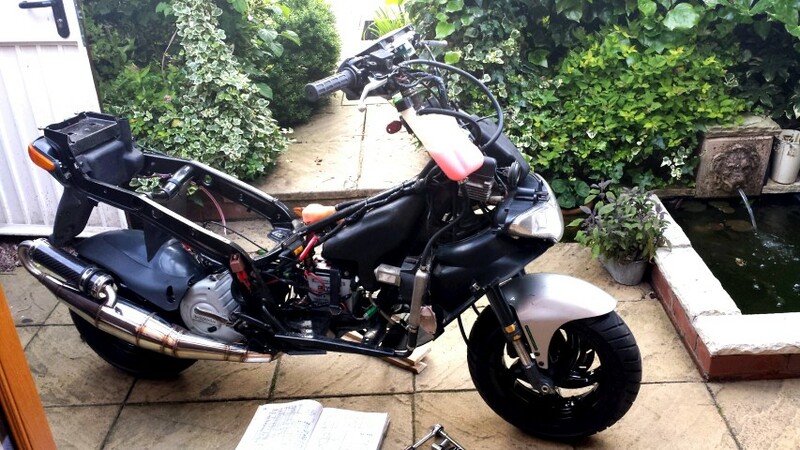 My first bike was a second hand Yamaha RS100, which i promptly stripped down and did a frame up restoration. This was the first in a long list of two stroke vehicles that followed a similar path during my ownership from the mid to the late 80s. These included Yamaha DT100, DTLC, DT175MX, RD125, RD250DX Suzuki TS125 etc, etc. In the early 90s I got the bug for scooters. My first was a Vespa PX125 none runner, brought from a neighbor which i sold on to a friend a couple of years later, Following this was a second PX, then a Vespa T5. So the late 90s became the stage for one of the most powerful, if not the most powerful scooters ever mass produced, the 180cc two stroke Gillera Runner FXR. In standard guise they were pretty rapid, but with the heavy baffled exhaust system which choked the engine, and the standard carburetor and air box fitted from factory, it didn’t quite reach its full potential. Owners soon became wise to the tuning capability, and the market was there to offer a verity of third party options for those that wanted to get the best performance from the new kid on the block. This era was short lived and the ever tighter EU standards for emissions ruled out large two stoke bikes as being too polluting. The only way the manufacturers could meet regulations for all but the smallest of scooters was to move to a 4 stroke engine. This offered less potential BHP, and were substantially heavier. So the old power to weight ratio for the later scooters was reversed. 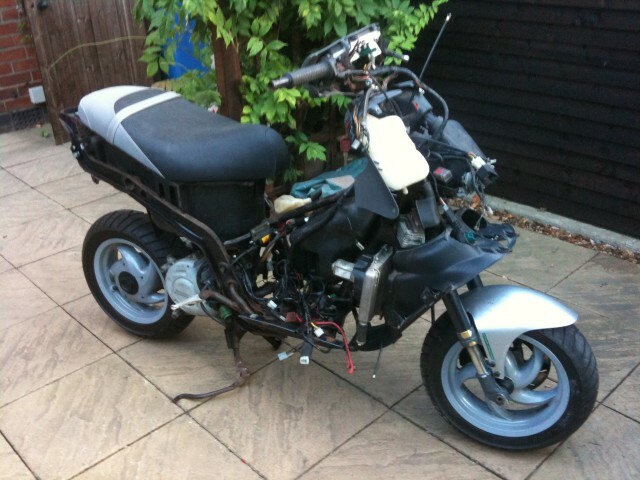 This is why the sweet spot for anybody wanting a scooter or motorbike with the best power to weight was towards the end of the 1990s. The FXR was the earliest incarnation of the 180cc Runner which came with a rear drum brake. The later scooters were branded ‘SP’ and came with a rear disk brake. 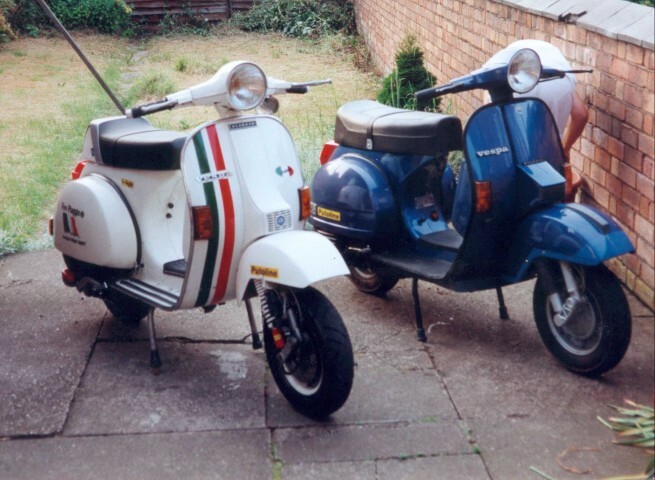 As you can see mine is one of the earlier scooters, and unless I am mistaken was the rarer of the two, as production moved on to the SP after a relatively short period of time. I do not see this as a negative as the disk brake was really just a marketing gimmick, and offered no better stopping power. I never owned or ridden one of these scooter before, but I knew of their reputation for being the scooter to have in its day. However, the reputation was enough for me to make the decision to buy when one came up at the right price in 2011. It may come as no surprise after reading the above, that the scooter i purchased came in kit form…. 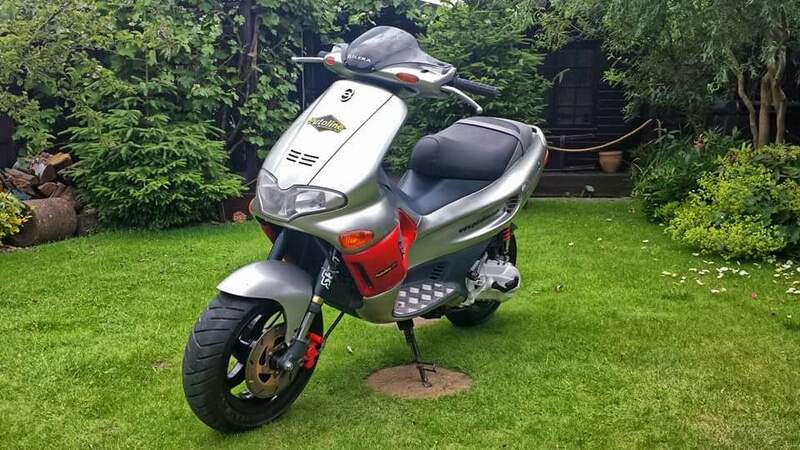 I was in no great rush to get the scooter road worthy, which was just as well really as i didn’t finally get it on the road until 2014. I must admit, from a performance point of view, once registered, moted and insured it exceeded all expectation. What a blast!